It doesn't take more than two round ears and a waving white glove to see that a certain character is about to transport you to a happy place, just with his high-pitched chuckle! Joined as always by familiar friends, the one and only Mickey Mouse is celebrating a milestone—90 magical years since his remarkable debut! Now, he's about to become a part of your favorite game collection, so choose a partner and prepare to play. 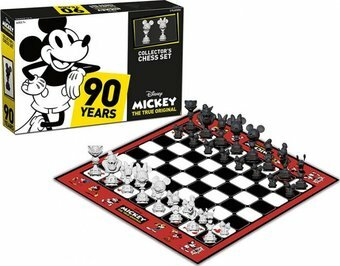 Disney Mickey: The True Original Collector’s Chess Set is here! Everyone’s favorite mouse is taking over your tabletop as Mickey Mouse and his pals take on the form of a different crew: 32 custom Chess pieces! The joyful faces from your childhood will soon be available for you to play the classic strategy game in a whole new way, with Mickey Mouse & Minnie Mouse as King and Queen, Donald Duck & Daisy Duck as Bishops, Pete & Goofy as Knights, and more!